Eternal Flame presents Elvis 35th Anniversary Concert. In commemoration of the 35th Anniversary of Elvis’ passing, this special concert took place at the FedEx Forum in Elvis’ hometown Memphis, Tennessee on August 16th, 2012. The publicity states... This 35th Anniversary Concert is the icing on the cake of a very special Elvis week that year. It starts of with spectacular special effects, re-creating Elvis’ birthplace in Tupelo and from there the story begins. It takes us from the early ’50’s to the Movie Years, Gospel, The ’68 Comeback Special, The Vegas and On Tour years and the Aloha From Hawaii Special. Special video’s were made to announce every chapter of this concert, not to be seen in regular productions of ‘Elvis The Concert’ or ‘Elvis In Concert’. This is quite simply the best Elvis Video Concert ever produced filled with many original band members that played with him throughout his career. As a special treat Lisa Marie Presley appears with an amazing duet and touching video of ‘I Love You Because’. As a bonus on this DVD you will get the original video in high quality as it was produced for this concert. Lisa Marie showing the new exhibitions and Priscilla and Lisa Marie at the Candlelight Vigil. The footage on this DVD is combined from the best available fan footage shot that night and is in great quality and sound. Many different angles were used to produce the best possible impression of this very special concert for your viewing pleasure. 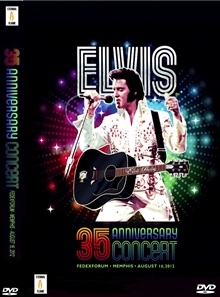 t is the most complete DVD production of ‘Elvis The/In Concert’ ever. Region Free NTSC DVD.